Sometimes it’s the little things that irritate us and cowlicks are no different. By definition, they’re that annoying tuft of hair that sticks up, like Alfalfa's in the "Little Rascals" movies. Some would describe it as the uncooperative way hair bends in the front where bangs are. Either way, it’s hair that won’t do what we want and male or female, that little piece of hair is going to bother you all day. DO NOT cut that piece of hair. If you cut that hair short, it is more likely to stick up, not less. Furthermore, if your hair and tuft are at different lengths, that one short chunk may end up looking even more awkward. DO NOT over slick it with gel. This is a popular tip and it can work. However, many times, the gel will take some time to harden and set and during that time, that tuft can stick up without you realizing it. DO NOT give up! It may be a small thing but it’s your hair. Where there’s a will, there’s a way. Wash your hair. Sometimes hair becomes oily and dirty and a cowlick is a sign that your hair needs a wash. This is probably the first and easiest step you can try. Use petroleum jelly. If washing does not work, a quick fix to try is a little bit of petroleum jelly. Take the tuft of hair and put some petroleum jelly, working it through that piece of hair with a fine tooth comb. This may work to weigh down the hair. Cover with longer hair. If your hair is long enough, this is a simple and easy fix worth trying. 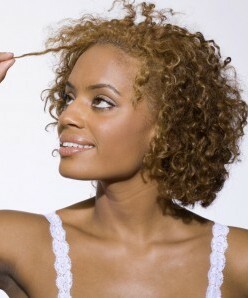 Weigh down the cowlick by covering it with longer strands of hair. This especially works if it’s near your bangs but it is possible to do this anywhere along the scalp. Blow dry your hair. After placing leave-in conditioner and other styling products in your hair, use a hair dryer and work against the angles of the cowlick. Take a chunk of your hair including the cowlick and with a round brush and hair dryer, work the hair towards the left, followed by the right. This will not only help the products dry faster, it will also help train the cowlick to go in the desired direction. Use a flat iron. If your cowlick happens to be a part of your bangs, there are cowlicks toward the front of your scalp or if the hair dryer did not have the desired effect, try using a flat iron. Repeat the same process as you would with the hair dryer, taking small chunks each time and working the hair first to the left, then the right. This should help flatten any unwanted tufts. When all is said in done, that tuft is your hair, so embrace it. Use products and tools to make your cowlick work for you. If all else fails, don’t chop off your hair because of some cowlicks. Be adventurous and try a new updo or consult your stylist for more information. They may just have the down-low on a new product or method that you haven’t tried. How do you handle your curly cowlicks?